Tim Whitrow, who filmed his encounter, can be seen trying every trick possible to try and get the adorable koala bear out of his vehicle. Not even his curious dog seems to bother the little guy. Whitrow is rather brave and despite his anguish as he tries to prevent the koala from climbing on top of his dashboard, you can't help but cringe with him as those huge claws scrape the interior of his car. Koalas are generally not friendly towards people, especially those in the wild and are known to bite and scratch. 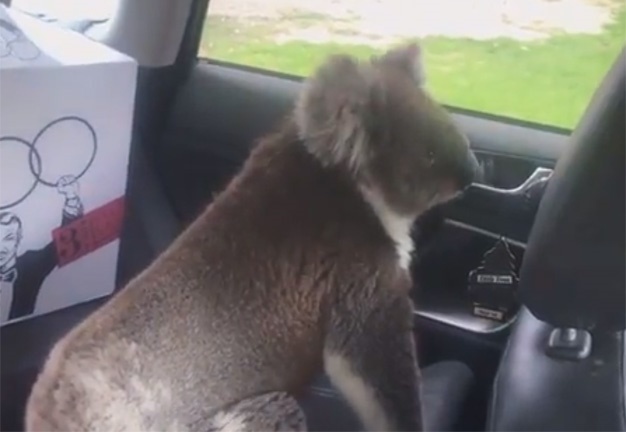 The owner of the car tries to be as gentle as possible, opens all the doors, before the koala eventually scampers off unwillingly.